"But doc, my blood pressure is always normal at home." I wish I had a dollar for every time I have heard that line and I know it is true. When some patients come to see me, their blood pressure is abnormally high (above 130/90) and this is known as "white coat hypertension." Although it has been thought to be from anxiety about seeing the doctor, even long established patients who have no conscious anxiety can exhibit elevated blood pressure in the office. Because blood pressure naturally fluctuates and the office visit is not a "normal" setting, it is important for patients who have hypertension (high blood pressure) to have their own BP cuff at home. Now that devices are automated and easy to use, everyone with hypertension should be monitoring their BP in the comfort of their own home. I advise multiple readings over a week at different times of day. Get a reading when resting and when rushing around. Take the BP after you exercise and after a meal. It is important to keep a log and write it down. Only then can we see patterns and know if the blood pressure is controlled or not. Blood pressure readings in the doctors office are not necessarily the most accurate. Patients are often rushed trying to get parked and in on time. Medical assistants can use the wrong size cuff or not position the arm correctly. 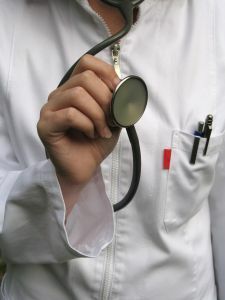 Auscultation (listening) is not very accurate due to errors. 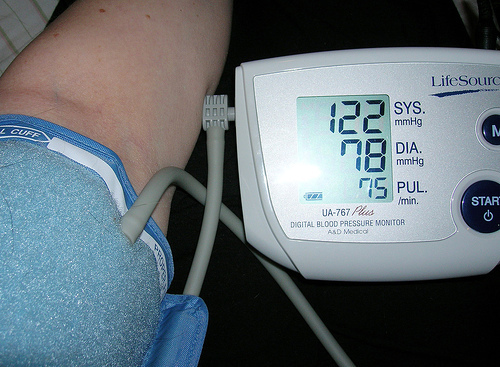 It is the multiple readings over time that give a more accurate picture of blood pressure control. High blood pressure in the office can be true hypertension or it can be "white coat hypertension" that is usually controlled at home. If a patient is on blood pressure medication and has controlled BP at home, I will not add more medication just because they are elevated in the office. If a patient has not been diagnosed with hypertension and the BP is elevated in the office...that patient is advised to get their own home cuff and return with readings for us to review. This way we can minimize unnecessary and expensive medication and make sure we are protecting the patient as well. The more posts on this, the better. It's a term that's thrown around too much, and often used by patients to dismiss real hypertension. Likewise, physicians shouldn't jump to medicate someone who may have artificially elevated blood pressure in the office setting a few times. This actually happens to my grandmother, who if anything, is hypotensive at home. 1) If you're using an automatic, battery powered blood pressure measuring device, make sure your batteries are not too worn down. According to the folks at Omron, low batteries can cause falsely low readings. 2) Also, it's not a bad idea to have your automatic measuring device factory calibrated every so often. Check with your manufacturer for their recommended calibration interval. Calibration typically includes sending in the cuff with the electronics to ensure that the cuff is working correctly. Now back to taking my blood pressure with a white coat on to see if I can desensitize myself to lab coats. At my doc's office, the chair is abnormally high that they use for drawing blood, checking bp etc. If I don't push forward and plant my feet firmly on the floor my bp registers as high. Feet on the floor - it returns an accurate reading in the normal range. In these blog there are so many things which can be great and also looks very awesome it can be one of the anexity these all are great to know about it. Love the post! Especially your emphasis on the importance of the BP over time not just one check. DO you have any suggestions about how patients can communicate their findings to the providers in real time? For example, Jordan Shlain, M.D., cofounder and president of Health- Loop, in San Francisco, believes that follow-up is the best medicine. 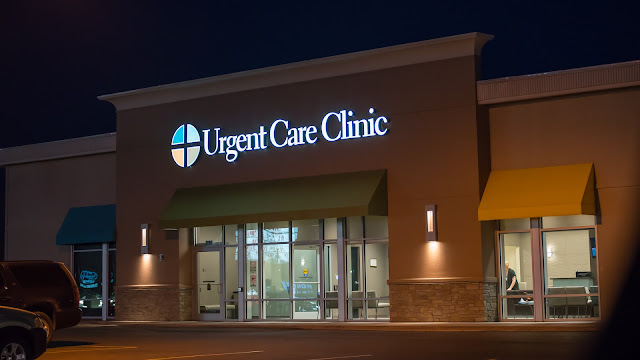 By creating a clinical online communication platform, providers and patients have a way to ensure that information does not “fall through the cracks” between appointments. Providers get patient feedback about symptoms and conditions and improve compliance with care plans, while patients can simultaneously view data about their conditions and communicate with doctors about how they are feeling. In effect, it enables doctors to manage their entire patient populations within a single dashboard. Joy, here's an example of a Wi-Fi capable, home blood pressure monitor with the ability to forward data. I'm not sure how one deals with HIPAA requirements in the sending of data from home to office. Anyway, I figured it out after taking my wife to get some sushi tonight. We ordered four or five different Media Sales, a seared spicy tuna salad, and a sprite. It wasn't until the end of the meal that I figured out how I felt about it. Kristin saved the last piece of a roll for me because it was my favorite out of all of them and I told her to eat it. paper cranes in dinner time (^,^). Just came back from lab on 3am but I still have to clean up my room and packing my stuff because I have to go on 6am in the morning. What a (two) day (>,<) But there always busy time like this so you can appreciate your spare time. Let's just enjoy our life.